Disclaimer: The following feeding method should not be attempted with pigs other than American Guinea Hogs. American Guinea Hogs are known for their gentle disposition. I've belly-rubbed full-grown intact boars, and I've witnessed week old shoats being plucked from underneath a momma Guinea Hog's nose without protest. Pigs can be dangerous animals and should be treated as such, but American Guinea Hogs are one of the pleasant exceptions to the rule. Having said that, however, they are the hungriest animals I've ever encountered and, as such, take meal time very seriously. Feeding time requires the right equipment and the right attitude. 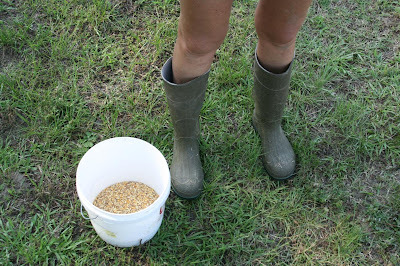 Proper Equipment - rubber boots and a good bucket. Right Attitude - something akin to that of a halfback going for a touchdown. 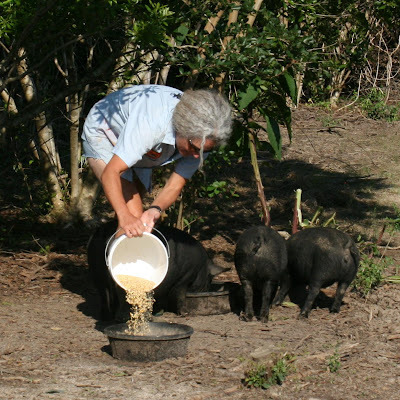 Every morning and evening we supplement our pigs foraging with a custom mix of scratch grains and dried, ground, baked soybeans (nothing artificial & blended to 15% protein). 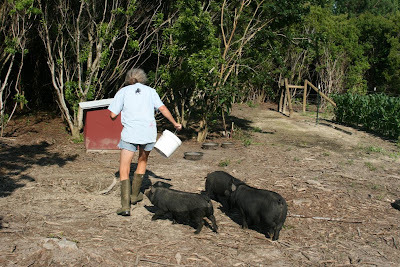 Our porcines graze on pasture and root in a wax myrtle forest all day so they don't need much feed. We also add a touch of diatomaceous earth to help with parasites. Between Bo (our boar, 5 months old) and our two 4-month old gilts (Scarlet and Magnolia), they get 2 quarts of feed twice daily. Our hogs LOVE, LOVE, LOVE their feed. Did I make that clear enough? Let me reiterate. They LOVE their feed and will do darn near anything to get it. This includes jumping on you, bumping you aggressively with their noses (which leaves muddy marks on the legs), and fighting amongst themselves. 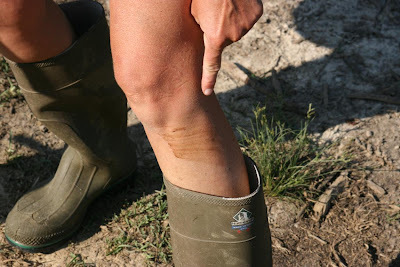 The boots help with the muddy issue, and I avoid wearing pants that I care about. Although most nudges land on the shins, the little porkers do occasionally get in a good thigh tap. Avoiding the jumping requires some moves, so I try to stretch well prior to feeding time (okay, not really, but I probably should:). We start at the gate. Me on the outside, them on the inside. Like good defensive lineman, the hogs grunt and squeal and make charges on the line. Once ready, I sling the door open and sprint towards their feed bowls. They immediately move on me to block and tackle so I spin, dance and jump my way to their bowls. I'm faster than they are so I always get there first, but spiking the bucket isn't an option. This is where it gets tricky as I have to split the feed equally into three separate bowls. (We tried using a feed trough, but Bo just crawled in and laid on top of the feed to hoard it. We feared he was going to break his legs getting in and out of the trough and the girls weren't getting anything to eat so we ditched the trough idea.) Once I reach the bowls, I dump a shot into the nearest one. This takes the piggies' focus off me and onto the food. As the three of them attack bowl #1, I fill the other two quickly as they're always a mere hoof step behind me. I am happy to say that our hogs have never attempted to bite me, although they occasionally do nip each other. The pigs are hilarious. The food in each bowl is the same, but the little porkers constantly move from bowl to bowl kicking out the lesser pig and sending them packing. Poor Scarlet is the little one so she spends the most time moving from bowl to bowl. Bo is the biggest and gets the most feed, but this doesn't stop him from thinking the feed must be better in the next bowl. Bo bullies Scarlet and Magnolia; Magnolia bullies Scarlet; and Scarlet just eats what she can. Every once in a while she makes a move to bully one of the other pigs, then pauses, thinks better of it, and returns to her bowl. I pet them through the whole process and our chickens often join the meal. In the future we're going to build a feed tray for the bowls that I can access from outside the gate. As they get bigger and hungrier I don't want to take the chance of getting knocked down. That is truly a frighting thought - tackled by pigs with no referee to stop the fray. The chickens wear the right uniform, but they seem more interested in pecking up the extras than monitoring the game. Oh well! Some friends came out to the farm on Sunday to see the pigs, stock up on eggs and loot the garden. 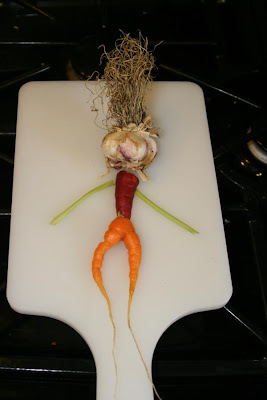 They left with some excellent booty (carrots, onions, garlic...), and we gained some valuable knowledge. We have a 1/2 mile trail on the property and of late it's has been spattered with discarded bird eggs, large blue-green ones to be exact. The eggs aren't as big as our chicken eggs, but they aren't small like a robin egg either. Our friend Cary happens to be an avid birder so we were hoping that she'd be able to identify the eggs and the birds that produced them. 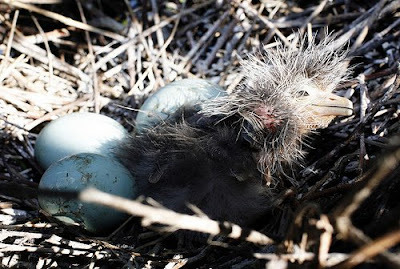 Based on the size of the eggs and a description of their call (something similar to a fox barking), Cary told us they were probably herons. 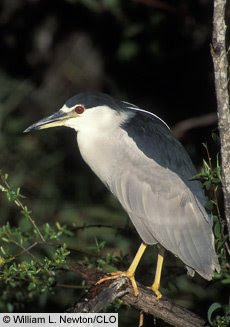 She sent us a link to http://www.allaboutbirds.org/ and after listening to a few calls we narrowed the birds down to Black Crowned Night Herons which make a barking call and are nocturnal. We've only heard the calls around dark so her identification fit perfectly. We love our chickens and will post more about them later, but this discovery was too exciting not to share. 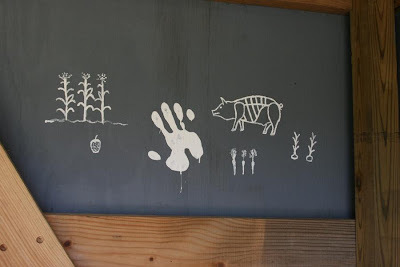 Well I've heard that pigs are intelligent, but this is ridiculous....porcine cave art! Who would'a thunk it? Okay, okay, the pigs didn't really do the artwork. 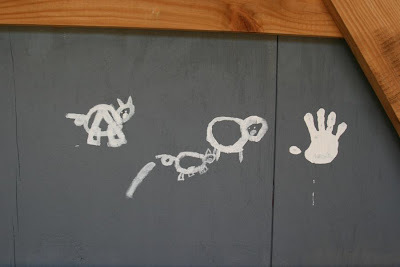 We just finished their new pig shelter and the kids thought a little wall art was just what the place needed. I'm not sure if the pigs are impressed, but we had fun. 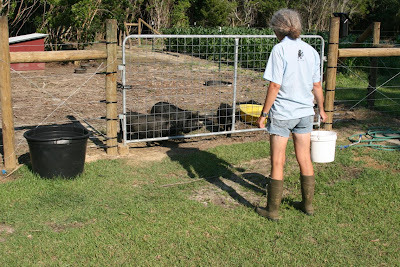 If you're just joining us, we raise American Guinea Hogs - a rare homestead farm animal. As of 2005, there were approximately 15 AGH's left in the country. The number is now up to 400+ as the breed is making a comeback on small farms around the country. Guinea Hogs don't paint (well, not to my knowledge), but they are special in other ways. They have friendly dispositions, have the ability to feed themselves by foraging on pasture or woodlands, and they produce exceptionally tasty meat. The American Guinea Hog is one of three pigs listed on Slow Food International's Ark of Taste. We have three breeder hogs at the moment that are in the 4-5 month old range and should have young pigs for sell around Christmas time of this year. Stay tuned for more. 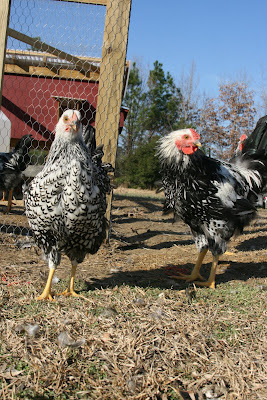 Welcome to Bluefield Acres blogspot. 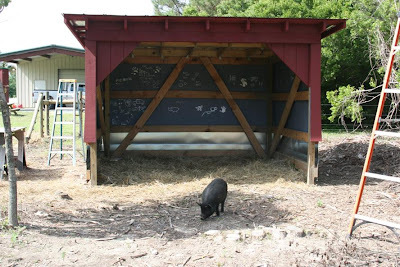 Bluefield Acres is a homestead farm in Bladen County, NC. 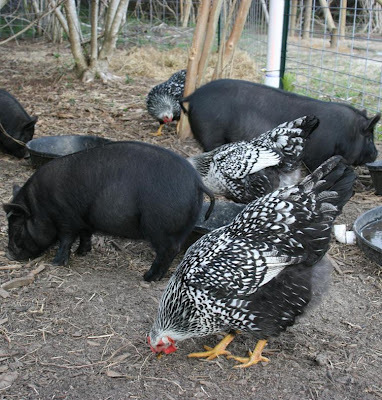 We currently raise free range Wyandotte chickens and American Guinea Hogs. American Guinea Hogs are a rare heritage breed hog native to the Southeastern United States. They are known for their excellent disposition, ability to forage for their own food and their tasty meat. 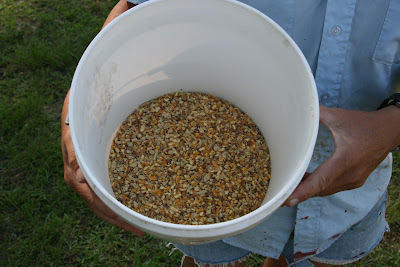 This blog will talk about our adventure in homestead farming and we hope you enjoy what you read.